This morning, we had a blizzard. I lay blissfully in bed and heard my little girls clomp past the bedroom door in their heavy boots. “Don’t forget to cover your ears,” said one to the other. “Why?” the second one asked. I was thrilled to the core — not only because my daughters’ nice little ears would be protected from the swirling winds, but because they used those nice little ears to listen to me. They had listened to me, and spontaneously decided to obey! If you’re a parent, you know how sweet and rare an event this is. “Cover your ears” is advice they could get from anyone; but there is no replacement for the loving, trusting relationship between a mother and child, and I was so grateful for even this small evidence that our relationship was secure. I would be up and out of bed faster than you can say “Bosnia and Herzegovina,” blazing with rage and terror while demanding to know who the hell was in my kitchen pretending to me be. Someone who looks like me and acts like me is telling my kids what to do, and telling them to call her ‘Mama? '” Hell, no. Hell hell hell no no no. Even if she told them to wear a hat. Hell, no. Dear children, Let all the prayers you say in your homes in the evening be for the conversion of sinners because the world is in great sin. Every evening pray the Rosary. Nothing wrong with that, right? It’s a perfectly good message. We all should pray for the conversion of sinners. It would be a good thing if more people followed this advice. Good fruits can come from visiting Medjugorje. The conversions, the deepening of faith, even the possible healings — all are due to God’s mercy, His willingness to send the fresh breath of the Holy Spirit in through any crooked little crack. He will show up wherever He is welcome, even when He’s welcomed by pilgrims who’ve been deceived. So yes, there are good fruits. But nobody gets to pretend to be my mother. There aren’t enough good fruits in the world to justify sitting back and letting that happen. If you care to see it, there’s mountain upon mountain of evidence that the apparitions are false — either a hoax perpetrated by the seers, or something diabolical. I’m referring to ‘the Devil’s dung’, to money, what else? At Medjugorje everything happens for the sake of money: pilgrimages, overnight stays, the sales of trinkets. In this way, abusing the good faith of the poor people who go there with the idea of meeting the Madonna, the false seers have set themselves up financially, they have married and live a wealthy life, to say the least. When Our Lady first allegedly appeared to the six youths in 1981, she reportedly told them she would only appear three more times. She has since appeared, according to the alleged visionaries, 47,000 more times. 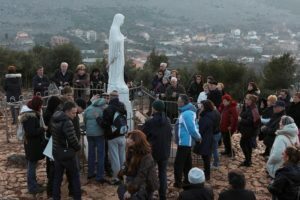 Considering everything that this diocesan chancery has so far researched and studied, including the first seven days of alleged apparitions, we can say: There have been no apparitions of Our Lady of Medjugorje. 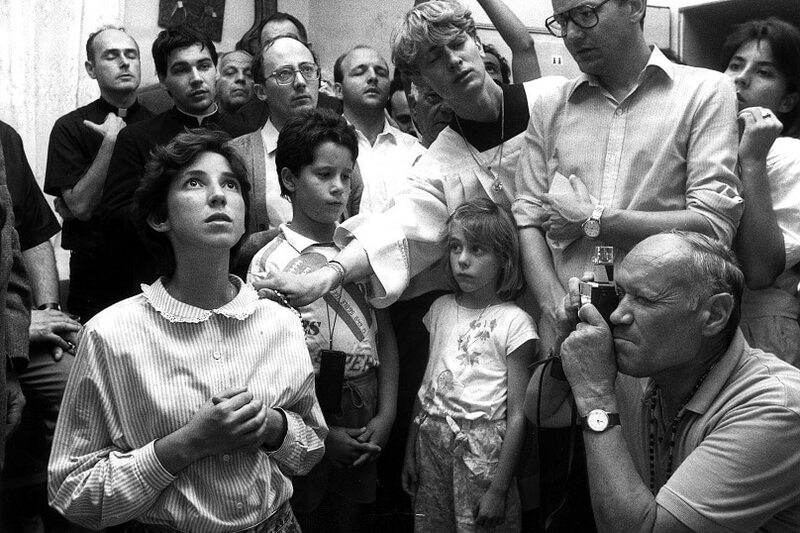 the “apparitions” have been studied by several commissions: in 1982-1984 and 1984-1986 at a diocesan level, and in 1987-1990 by the Croatian bishops’ conference. The Vatican’s Congregation for the Doctrine of the Faith studied the phenomena from 2010-2014 and again from 2014-2016. The local and national commissions arrived to the conclusion that there’s nothing supernatural to the apparitions. Devotees of the alleged apparitions are quick to point out that the Church has never formally pronounced the visions to be false; that Bishop Peric’s words are only his opinion. True, but the Church generally does not issue a formal position on apparitions until after they have ceased; and three of the alleged visionaries claim Our Lady keeps turning up like clockwork every day for decades. Unless there is a conflict with an important college basketball game. Then she obligingly changes her plans and shows up somewhere else. When CDF ordered a St Charles, MO parish to cancel an event where Dragicevic had promised Our Lady would appear, telling the faithful “they are not to participate in events that promote the so-called visionaries of Medjugorje and in particular Mr. Ivan Dragičević,” and said “No other such events should be scheduled,” Dragicevic simply changed the venue to his own home and invited 75 of his closest friends, and waited while Our Lady snuck past the CDF and showed up once again. None of the seers have discerned a vocation to religious life. They all make a good living solely from their association with Medjugorje, especially Ivan. Ivan’s home in Massachusetts is valued at over $800,000 and was paid for in less than a year. His sole income is related to Medjugorje. He sells tickets to the (air conditioned! Wine included with meals!) house where she allegedly first appeared. This Mother of God giggles. She goes through lots of wardrobe changes. She lets people step on her robe, and then appears grubby from being touched. She moves up and down, here and there, at the behest of the seers. She shares her opinions on local politics and calls a fornicating, philandering priest a “saint”. And she’s a little careless about that baby she likes to drag around. And whenever she’s faced with the choice of encouraging her children to respect and obey their bishops, or appearing in the air as paid ticket holders look on, this Mother of God always goes for more ticket sales. The Pope is now sending a Bishop to Medjugorje purely to assess the pastoral needs of Catholics who travel there on pilgrimage. He will not be making any pronouncement on the validity of the alleged apparitions. In other words, he’s going to make sure that, no matter who’s appearing and telling the Church’s children what to do, at least everyone should have a hat on so their ears don’t get too cold. This is the true work of a loving papa: To care for the children. It does not mean that we children can just shrug and decide to call just anyone our mother, just because she also gives common-sense advice about keeping our ears covered. Cover your ears, by all means; but keep your wits about you. Use your brain; remember Our Lady’s example of humble obedience. 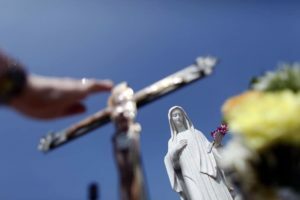 The Lady of Medjugorje is not Our Lady. She is not our mother.